Jane Austen is one of the most famous and frequently read authors in the world, and her six completed novels have been constantly in print (and adapted many times) since her fame developed in the later 19th century. Despite that, there is relatively little information about Austen's life. The only image of her which exists is an amateur painting by her sister Cassandra, and only a fraction of the letters she wrote survive. 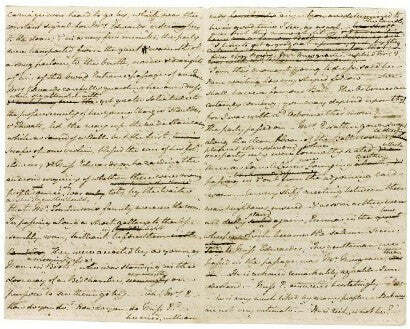 So for bibliophiles, today's news could hardly be more exciting: Sotheby's has announced that historic autograph manuscript of Jane Austen's novel The Watsons - the only major Austen manuscript remaining in private hands and the most important Jane Austen item to come to the market in over 20 years. Probably written in 1804, this heavily corrected draft represents the earliest surviving manuscript for a novel by Jane Austen. The work, unpublished during her lifetime and incomplete, provides a fascinating insight into both her writing practices and her development into one of Britain's greatest authors. It offers the reader an unparalleled glimpse into the very act of creation, with all the hesitations and explorations of the author's mind laid bare. None of the manuscripts of Jane Austen's completed novels survive, with the exception of two draft chapters of 'Persuasion' (at the British Library), Austen's juvenile work 'Lady Susan' (at the Pierpont Morgan Library, New York) and the fragment 'Sanditon' (at King's College, Cambridge), the only other autograph novel manuscript of comparable length. The Watsons centres on a family of four sisters - the daughters of a widowed clergyman. Its heroine is Emma, the youngest, who has been brought up by a wealthy aunt. When her aunt contracts a foolish second marriage, Emma is obliged to return to her father's house and endure the crude husband-hunting of her two twenty-something sisters. She has, however, a close relationship with her eldest and most responsible sister Elizabeth. Emma Watson to Lord Osborne: "Your Lordship thinks we always have our own way. That is a point on which ladies and gentlemen have long disagreed. But without pretending to decide it, I may say that there are some circumstances which even women cannot control. Female economy will do a great deal my Lord, but it cannot turn a small income into a large one." The novel is considered to be around a quarter completed. The manuscript comprises 68 hand-trimmed pages, split into 11 loose gatherings. These exquisitely penned pages in Austen's tiny, precise hand are heavily worked through with revisions. They would obviously make a strong investment. Written at a time when Austen wasn't yet a published writer - but a period in her career that is nonetheless considered to be her mature writing period - 'The Watsons' was Jane Austen's only literary composition between the completion of 'Northanger Abbey' in 1799 and the commencement of 'Mansfield Park' in 1811. The work is well known to Austen scholars and has been acclaimed by modern critics, including Margaret Drabble who described 'The Watsons' as "a tantalizing, delightful and highly accomplished fragment, which must surely have proved the equal of her other six novels, had she finished it." Parallels have been drawn between the character of Emma and the author herself. Austen confided to her sister Cassandra that Mr Watson was to die in the course of the work. Her own father died in 1805 and Jane Austen left the manuscript incomplete, prompting much speculation about the reasons behind her decision. 'The Watsons' was formerly owned by Joan Austen-Leigh, a descendant of the author living in Canada. The first 12 pages were sold during the First World War for the benefit of the Red Cross and are now in the Pierpoint Morgan Library in New York. The manuscript as it now stands - sections three to eleven - comes to the market for the first time since 1988. It will be exhibited in New York from June 11th-17th, then for three days in London ahead of its sale in Sotheby's English Literature and History auction on July 14. It carries an estimate of £200,000-300,000 (up to $485,000).